Through technology we can inspire people, no matter where they live, to connect with, cherish and champion wildlife and nature for the benefit of all. Helping people connect with the beauty of the underwater world in home aquariums, while causing no harm to the wild places and animals they represent. Tens of millions of colorful tropical fishes are taken from coral reefs each year for household and public aquariums. Up to 90% of these may be caught illegally with cyanide, a poisonous chemical and stunning agent that enables easy capture of fish but also weakens and kills wildlife and reefs. Marine aquarium enthusiasts unknowingly contribute to the harm and destruction of the very animals and places they cherish, in part because the illegal and unsustainable nature of wildlife capture for aquariums is obscured by misconceptions. Contributing to the problem are trade practices, such as confusing and misleading signage, that mask the wild origins of the sea creatures on display and offered for sale. While a 2012 poll revealed that 72% of respondents believed that only captive-bred fish are suitable for saltwater aquariums, few people are aware that just 2% of species kept in saltwater tanks are bred in captivity on a commercial scale. Many people think captive breeding is the norm, when in reality it is the exception. Tank Watch takes the guesswork out of fish selection and empowers consumers to make reef and wildlife-friendly purchases. We realized the immediate need to bridge major gaps in public awareness with information aligned with attitudes of care and concern for coral reefs and wildlife. We also wanted to foster and transform these attitudes into corresponding caring behaviors. With global smartphone use on the rise, technology was an evident tool for raising awareness and championing wildlife and nature. 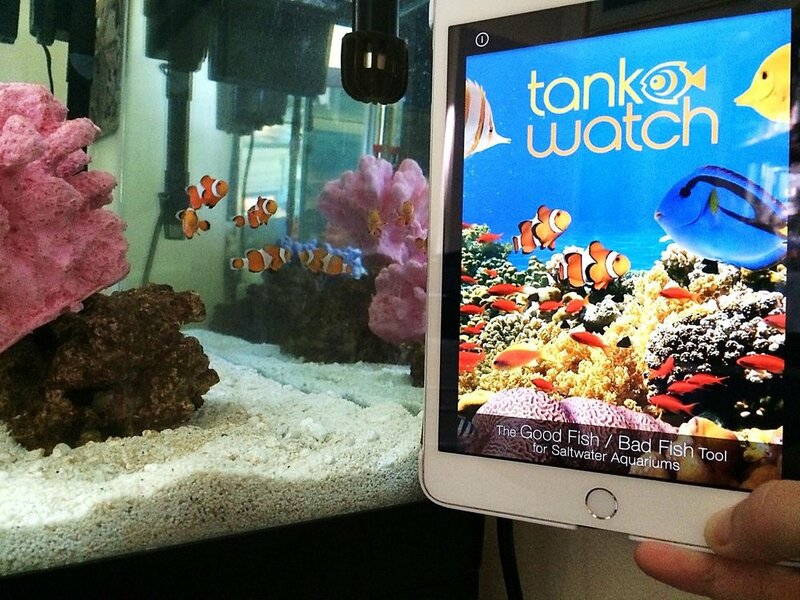 We created the mobile app Tank Watch – The Good Fish/Bad Fish Tool for Saltwater Aquariums to empower consumers to make wildlife-friendly purchases for their marine aquariums. Tank Watch delivers information that enables rapid identification of the 100 most popular aquarium species and focuses on their origins: Good Fish are captive-bred and available to consumers; Bad Fish are never cultured, always captured, possibly with cyanide. A mobile app offers maximum distribution and usage. Since launching in 2014, Tank Watch for Apple devices has been downloaded nearly 9,000 times. With the recent launch of Tank Watch for Android platforms, many more people now have access to the key coral reef conservation information. Additionally, in online publications, blogs, and social media, readers around the world are continuing to learn about the Tank Watch conservation message and value as a cutting-edge mobile-eco app for wildlife conservation. Partnerships and in-kind support are key for success. Underwater photographers from around the world donated many beautiful images for Tank Watch, including Michele Westmorland, a fellow of the International League of Conservation Photographers. We partnered with Aysling, a digital technology company that sponsored our mission and provided pro bono Tank Watch design, development and other services. We partnered with wildlife and animal welfare organizations like The Humane Society of the United States and Humane Society International, which promotes Tank Watch on their websites and in their “Don’t Buy Wild” campaigns. We also entered and became a Prize Winner in the Reducing Consumer Demand Category of the Wildlife Crime Tech Challenge, a project of the U.S. Agency for International Development, in partnership with National Geographic, Smithsonian Institution, and TRAFFIC.